With all the hubbub about my new book, I’ve not yet bragged about my husband’s new book, which came out right about the same time! DH Dana Mackenzie is a science journalist with a number of books to his name (plus myriad magazine articles, glossy brochures, conference proceedings, etc.) but since he’s a PhD mathematician he’s particularly excited about The Universe in Zero Words. Some of our friends have said that based on the title, they expect there to be no words in the book LOL! 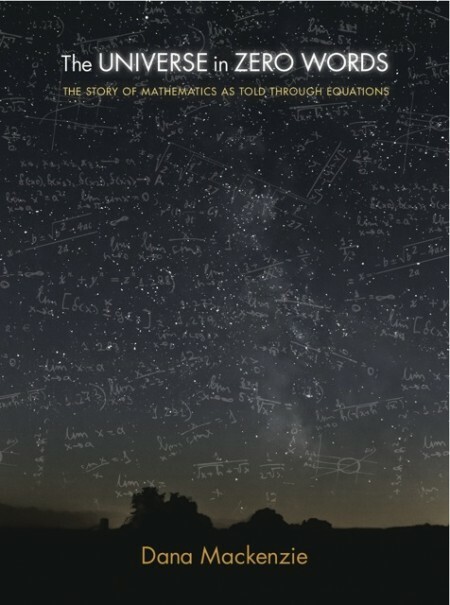 The subtitle is The Story of Mathematics as Told Through Equations. I explain that mathematicians don’t need words to express the universe, they have equations. But when we talk about the equations, we need words, so yeah. Dana describes the book as a history of 24 important and beautiful equations throughout the history of thinking mankind. It starts with as simple as 1+1 and goes from there, all written for the general reader. He loved writing it and we are so happy that it has finally come out. 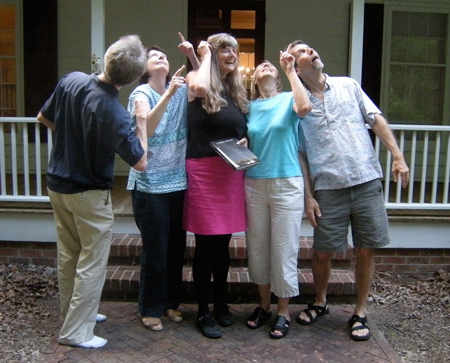 Dana, me, and some of our North Carolina friends. I’m not sure, but I think we may be trying to explain the universe in zero words. On another note, I’m packing for International Quilt Festival in Long Beach this coming weekend, July 26-29. I’m in the first row of the vendor mall, next to the exhibits, so if you’re headed for this big bustling quilt show and conference, I hope to see you there! Random.org has declared that the winner of Janet Pittman’s Appliqué: The Basics & Beyond is… Number 3, Melody! 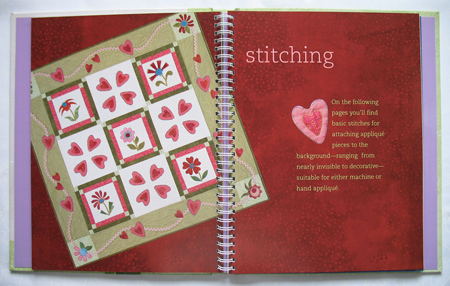 Melody says that this book will be perfect since she is just learning how to do applique, and she’s very excited. Welcome to appliqué, Melody! I must apologize for stating that the contest ended Friday, June 7. As they say on TV, I can explain! You see, I’m calendar-challenged. My whole life I have never been able to wrap my head around the fact that calendars split the weekend and put Sunday at the beginning. It’s a deep-seated conceptual thing that I’ve never overcome. So, just for the future, if my day and date don’t line up, go by the day, not the date LOL! I looked at the end of the week, which to me is Friday, and it said 7. You remember during our recent Book-A-Round that Erin Russek was turning her darling appliqué design into a pattern? She named it Miss Kay and I feel very highly honored. You can check out Miss Kay in Erin’s Etsy shop. Thank you Erin! It’s not every day that one is immortalized in a gorgeous appliqué pattern. At Spring Market in May, I stopped by the Landauer booth to find out more information about one of their upcoming appliqué titles. I happened to speak with the right person! The staff member in charge of digital marketing was thrilled at the prospect of sharing their appliqué titles with All About Appliqué and handed me a couple to peruse. One of them was Janet Pittman‘s Appliqué: The Basics and Beyond. I sat down and looked all the way through through the book. It’s fantastic, and I was presented with a copy to take home in my suitcase. Thank you, Landauer! Janet has really done a comprehensive job of presenting information about appliqué… several kinds. After a section on equipment and supplies, we’re on to the preparing, stitching, and embellishing! There’s paper-backed fusible-web, turned-edge with template and starch, turned-edge with freezer paper and glue, turned-edge with freezer paper on the wrong side and also the right side, faced appliqué, marked-line and thread-basted, you name it, Janet has covered it. And it’s all beautifully photographed and illustrated for you. One of the really cool things about the book is that it’s spiral-bound inside a hardback cover so it lays flat. What a nice convenience. The subtitle of the book is, “The Complete Guide to Successful Machine and Hand Techniques with Dozens of Designs to Mix and Match.” In addition to all that appliqué information, there are a bunch of projects with complete instructions. There’s even an index in this comprehensive resource. 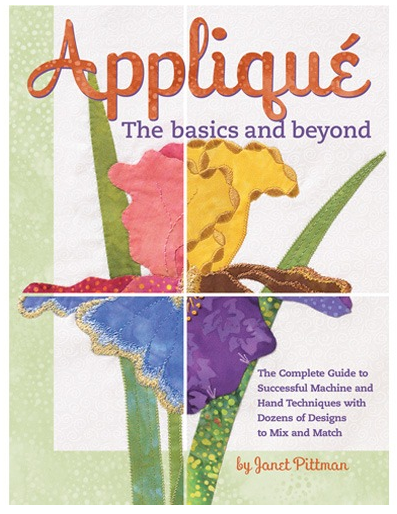 If you’d like to win Appliqué: The Basics and Beyond, please leave a comment here on the blog before 7:00 p.m. on Friday, July 7. Please pay close attention to the following. There are always a few who don’t understand how to leave a comment. If you receive this blog post in your email, replying to that email will not enter you in the drawing. You’ll need to click on the title of the post, which will take you to All About Appliqué on the internet. Scroll to the bottom and leave your comment there. Open to U.S. and Canada mailing addresses only.